Unibet Casino is the online casino gaming product that forms part of Unibet.com, one of the biggest online gambling operators of Europe. Unibet.com offers a variety of online gambling services such as bingo, poker, casino games, and online sports betting. The service includes more than 9.7 million registered customers from all over the world. Since Unibet has been granted licenses in markets such as France, Denmark, Belgium, Australia, Italy, and the UK, it is one of the safest, most secure, and well-regulated online gambling services for customers from over 100 countries. Since the company has been around for the past 17 years, it knows exactly how to make its customers happy. The company prioritizes on responsible, but fun gambling. Unibet Casino utilizes an elegant and sophisticated casino homepage that has everything you need, displayed on one simple and easy-to-understand website. It doesn’t matter if you’re an expert or first-time player at an online casino, Unibet Casino will make you feel right at home with the green, white and black colour scheme used to present their unique online casino. Upon opening the casino homepage, you will notice numerous languages and the different countries displayed to assist you in selecting the correct language before you start to explore the casino. Scrolling down, you will see four main categories that includes a tab for the casino, a tab to display all games, a tab dedicated to assisting you in getting started and a tab to showcase the current casino tournaments which you are welcome to enter once an account has been successfully registered. The Casino tab features a bunch of informative functions that will help you make the right decision on the games you wish to play. The All Games tab opens the incredible new world of games Unibet has on offer and can be filtered by slot games, roulette games, blackjack games, video poker games and table & card games. The Getting Started tab is a unique and interesting page that provides videos to explain the basics of slots, blackjack, roulette, table & card, live casino, mobile casino and free spin tutorials instead of a written article that no one ever actually reads until the end. This is a superb way to get the attention of new players and to teach them everything there is to know about the different types of games they offer. The Casino Tournaments tab provides a tournament schedule where you can win some impressive rewards while playing your favourite games. The page features tournament themes for every day of the week and includes Monday Movies, Tuesday Animals, Wednesday Irish, Thursday TV, Friday Exclusives, Saturday Table Games and Sunday Classics. You will see the latest casino offers, casino tournaments, Unibet casino app, current jackpots, top winners and winning right now displayed on the right-hand side panel of the website. You will also find a well displayed sitemap located at the bottom of the page that includes the help centre, contact information to reach the support desk, affiliate programs, careers at Unibet and the Unibet Group PLC information if you would like to know more about this incredible online casino and where it started 17 years ago. Lastly, you will see the casinos responsible gaming, terms, and conditions, security information and cookies at the far bottom of the page, ensuring you have all the information you could possibly want on the homepage alone. Unibet Casino does not offer a new player bonus, but players can win up to €30,000 in tournament giveaways. The online casino offers two special tournaments for new players—the €500 New Player Tournament and the €500 New Player Table Tournament. Every week, players can win up to €10,000, the first-place prize being €5000. In addition, the online casino is giving away 300 free spins to players who wager a specific amount of cash on specific slots. There are only a few online casinos that provide the same range of online games that Unibet Casino has. 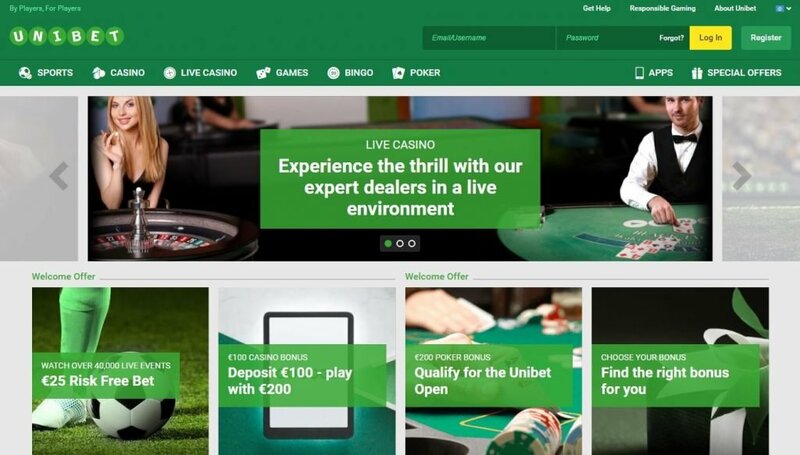 The Unibet Casino site is split into 3 main portions: Casino Black (Microgaming Quickfire/WMS), Casino Red (NetEnt) and the Live Casino. Casino Red is the most popular and largest of the three and you are welcome to play in every section with only one account. Casino fund transfers are instant between the three sections. Unibet offers an exciting collection of 413 slots, blackjack games, roulette games, video poker games, and table and card games. There are 26 progressive jackpot games such as The Dark Knight, Arabian Nights, Mega Fortune Dreams, Mega Moolah, Major Millions, Supercubes, Geisha Wonders, Winnings of Oz, The Pig Wizard, and others. The portfolio includes some games that can be found only at Unibet Casino. Some of these exclusive games are Troll Hunters, Bonus Beans, Epic Journey, East of the Sun, Rage to Riches, Jackpot 20000, and so on. The casino gaming services include a live casino and a mobile casino too. While the former enables players to take part in live casino games from the comforts of home, the latter enables players to play for real money on the move. Unibet Casino offers three casino apps—the Unibet Casino App, the Spin City App, and the Live Casino App. Want to play while you out and about? If you own a compatible Android, iPad or iPhone device, you can simply load Unibet Mobile Casino and instantly log in using your account information. The casino and games will appear instantly, and you will be able to enjoy over 30 different slot and table games wherever you are in the world. Unibet Casino is proud to show off their awards, and it’s no surprise when you have a look at all the awards they received over the last few years. Unibet Casino won Operator of the Year, Marketing Campaign of the Year and Socially Responsible operator of the Year at the EGR Awards in 2016. But that’s only the beginning as they also won Best Poker Affiliate Program at the iGB Affiliate Awards in 2016, Socially Responsible Operator at the IGA Awards in 2016, Sports Betting Operator at the EGR Awards in 2016, Poker Innovation of the Year award at the European Poker Awards in 2015, Online SportsBook Operator of the Year at the IGA Awards in 2015, In-Play Sports Operator of the Year award at the IGA Awards in 2015, Spin City App of the Year at the IGA App Awards in 2014, Innovation in Poker awards at the EGR Awards in 2014, Best Poker Marketing Campaign award at the EGR Awards in 2014, Innovation of the Year award at the EGR Awards in 2014 and Sportsbook Operator of the Year award at the IGA Awards in 2014. There’s no doubt that Unibet Casino is one of the leading online casinos in the online gaming industry. However, not everyone around the world will be able to enjoy such a stellar casino due to various restrictions placed on online gambling across the world. The countries that will not be able to play at Unibet Casino include Australia, Afghanistan, Ethiopia, Denmark, France, Estonia, French Polynesia, Yemen, Greece, Iran, North Korea, United States, Syria, French Southern Territories, Jordan, Pakistan, Romania, Philippines, Hong Kong and Turkey. Unibet has a comprehensive Help section, which players can use to understand issues related to login, responsible gambling, accounts, safety and security, mobile gambling, and so on. There is also a Frequently Asked Questions (FAQ) section, which offers answers to common player queries. Unibet Casino offers local customer care services in the Netherlands, Sweden, Denmark, Norway, Belgium, Finland, and the UK. Players can use the live chat facility or send an email or give the company a call at +44-203-725-3792. Unibet Casino makes gaming fun and exciting with the list of advantages they offer their valued members. The casino software is completely instant-play, eliminating the need to download the casino software on your desktop or mobile device. The casino offers gaming on most mobile devices and provides a vast selection of games from WMS, Microgaming Quickfire, and Net Entertainment. The casinos support desk is available 24 hours a day and 7 days a week via email, live chat, and telephone. All personal information is secured with the latest SSL encryption technology and is proven extremely fair by eCOGRA. The only disadvantages at Unibet Casino is the charges that players must pay when international calls are made to the support desk, and the Unibet Mobile Casino does not feature all the games you will find on the desktop version of the casino. Getting started at Unibet Casino is as easy as registering for real play and making a deposit using any banking method such as Skrill, PaysafeCard, Bank Transfer, and others. Since Unibet Casino bears the eCOGRA seal and certificate, the online casino is 100% safe and secure for players from different parts of the world. Unibet Casino also gives top priority to responsible gambling and urges its customers to play within their bankroll limits.